Gary Hart is a graduate of Yale Divinity School who seems a bit less than divine. Hart changed his name from Hartpence in 1961, lied about his age, and gave different explanations for these oddities at different times. He volunteered for John F. Kennedy's campaign for President in 1960, and managed George McGovern's campaign in 1972. He is a lawyer, an author, a former U.S. Senator (D-Colorado, 1975-87), and he twice ran for President. 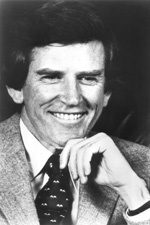 In his first Presidential run in 1984, Hart's campaign motto was that he had "new ideas". Walter Mondale, Hart's primary opponent for the Democratic nomination, responded by asking "Where's the beef?" an allusion to a Wendy's commercial where an ancient woman (Clara Peller) could not find the meat in her McDonald's hamburger. Mondale received the Democratic nomination. In 1987, Hart ran for President again and was leading in most polls when, at a press conference, a reporter asked about allegations of marital infidelity, which had been whispered for months. Hart replied: "Follow me around, I don't care. I'm serious. If anybody wants to put a tail on me, go ahead. They'd be very bored". The next day The Miami Herald reported that they had received a tip from a self-described "liberal Democrat" who said, in light of President Ronald Reagan's recent Iran-Contra scandal, she couldn't tolerate having another President who could lie so casually. The tipster's details seemed accurate, and The Herald put a tail on Hart in May of 1987. Their reporters had seen Donna Rice, a model, going into Hart's Washington townhouse at 9:30 one night, and 11:17 the next night, both nights accompanied by Hart. When asked whether they were having an affair, Hart replied, "I have no relationship with the woman". But The Herald pointed out that Hart and Rice were known to have mingled extensively at a yacht party, and had taken a trip to Bimini together on Hart's boat, called Monkey Business. There was also a widely-published photo of Rice sitting quite pretty on Hart's lap. Hart blamed the media for setting him up, but quickly withdrew his Presidential candidacy. He re-entered the race seven months later, but found his support flaccid. Michael Dukakis received the Democratic nomination, losing the election catastrophically. In 1998, President Bill Clinton named Hart to a bipartisan commission charged with studying America's defense against terrorism. The commission announced its findings in January 2001, warning that America was dangerously vulnerable to terrorist attacks, and recommending establishment of a new, cabinet-level National Homeland Security Agency. The commission's multi-million-dollar report was, of course, widely ignored until September of 2001. Hart has authored a series of pompous books, including The Patriot: An Exhortation to Liberate America from the Barbarians and Restoration of the Republic: The Jeffersonian Ideal in 21st-Century America. In May 2003, Hart announced he would not be running for President in 2004, disappointing his imaginary groundswell of supporters.